Three and a half years is an awfully long time to leave a small project hanging on that is intended to be built into something bigger later, but that's how it's happened. 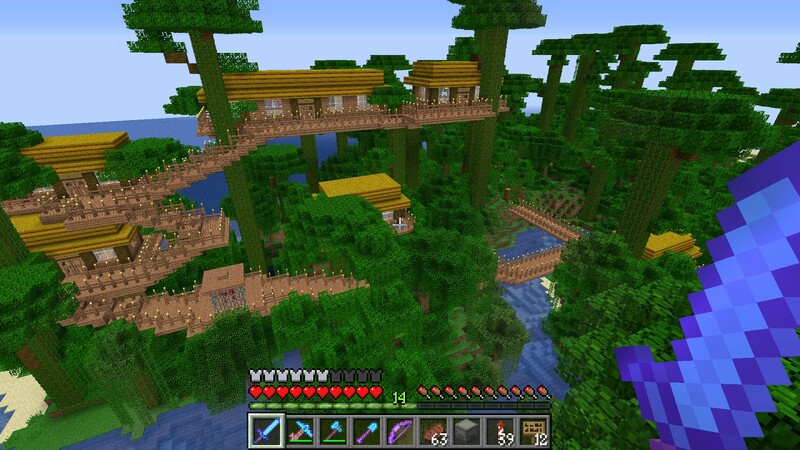 Project 15: The Cats and the Jungle saw me discover a jungle island almost 5 km to the east of the base and build a hut on it, just to stay in while I scoured the island for ocelots to tame into cats. 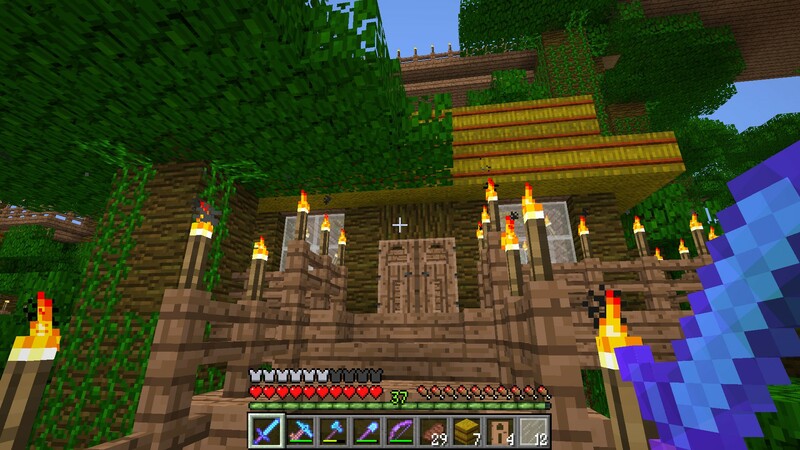 "The hut is - and eventually, the entire island will be - an elaborate reference to Treasure Island Dizzy", I said. This was June 2015. And ever since then, the island lay dormant as there were always more exciting and/or necessary projects to work on. 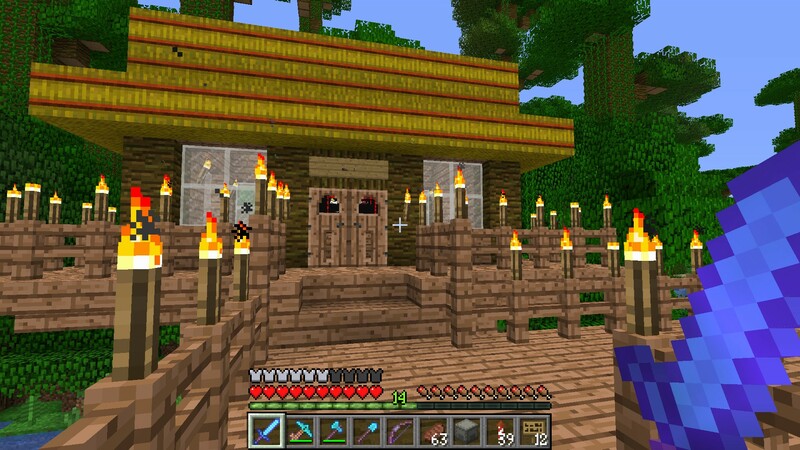 During the downtime between 1.12 and 1.13, though, I thought of something I could do with the Snoggles' Treehouse Complex, were I to build it. 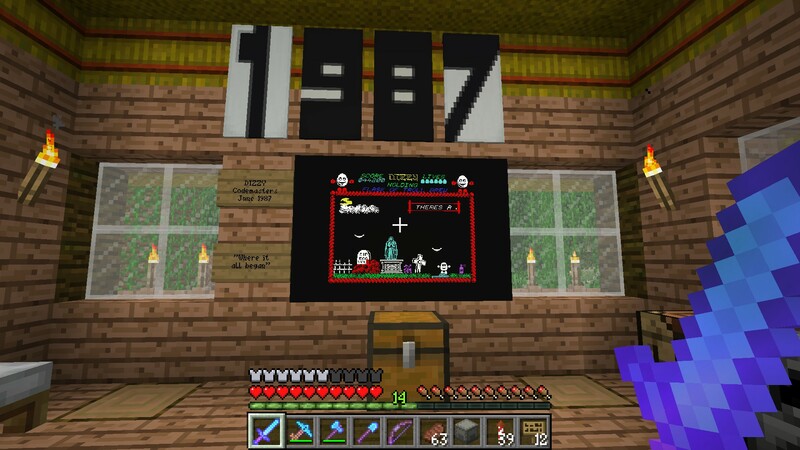 I'd assemble as many Minecraft equivalents of the items from the seven games in the main Dizzy series as I could - improvising very heavily in some cases - and make the complex into a shrine to the games which had given me so much enjoyment in my younger days when - unlike the much-revered Miner Willy games - they were actually forgiving in some way, and though I could never have hoped to complete any of them at the time, I could at least achieve something that made me think it had been worth spending my meagre pocket money. 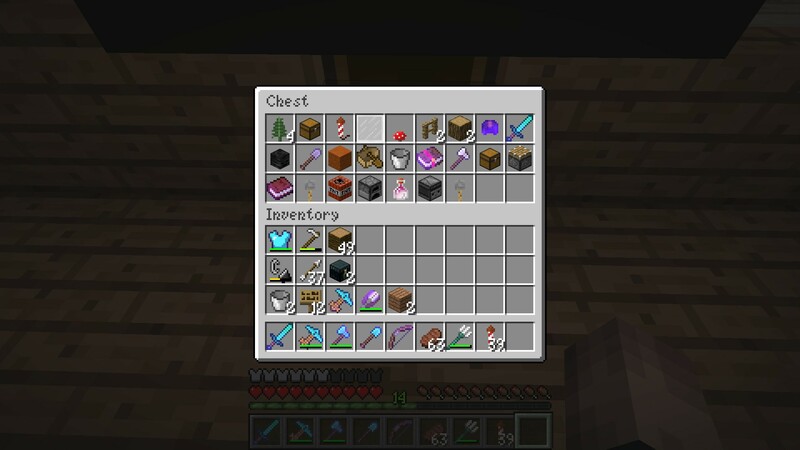 Axe in hand, a visit to Hop 'n' Chop's Treemendous Timber Yard later, I had a chest full of jungle wood to build with, and I was going to need a lot of it... as I would also need a lot of hay bales, so I'd held off trading all my wheat supplies away. This is a section of the complete map which we're focusing on - the Snoggles' Treehouse Complex, in which Dizzy can collect the essential snorkel, a video camera which is one of the valuables that'll be needed to trade with the shopkeeper on the second island, a glass sword and a detonator which will allow access to two more of those valuables, a Sinclair Abuser magazine which was supposedly a prank for a bad review, and 11 of the game's 30 coins (six of which are hidden behind mundane objects). 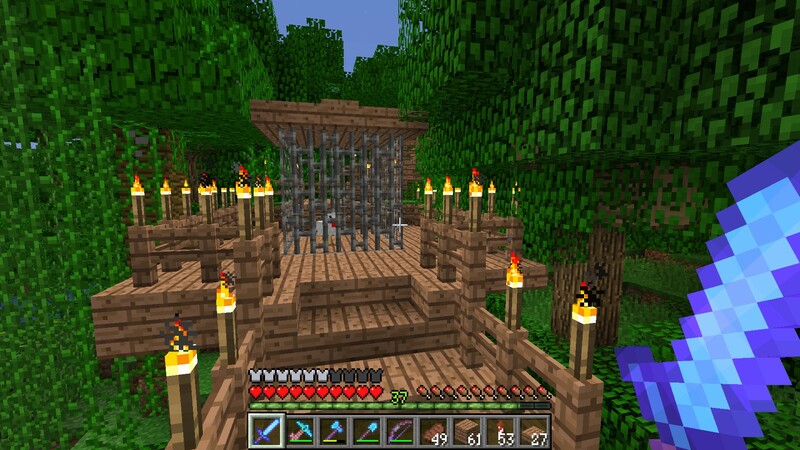 One of the falling cage traps is visible, but new players will inevitably blunder into the other two on a first attempt as they're hidden off screen. This is the initial hut I built last time, and the structure will be mostly unchanged - I'll just have to put in a few extra decorations to match what I'm doing with the rest. 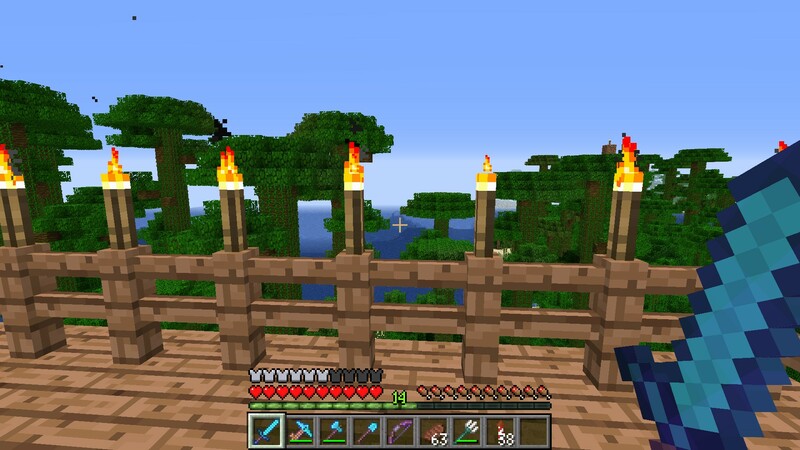 There'll be some extra torches, and a second bridge branching off from the first, that crosses back over the river and into the rest of the treehouse complex. 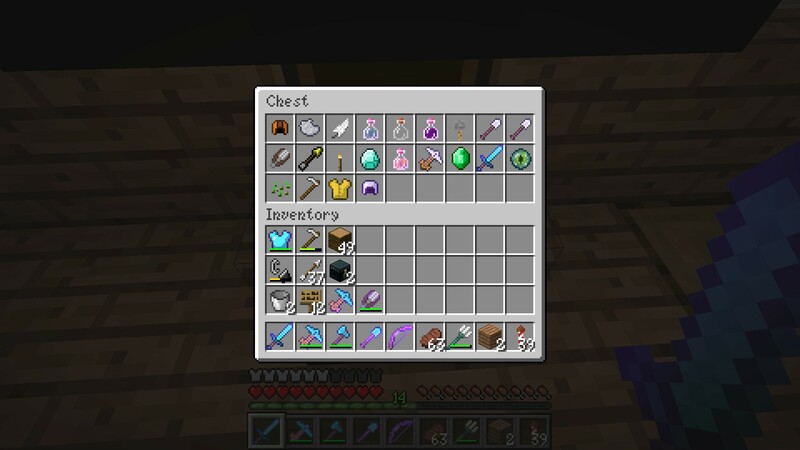 Time to crack out the stash of jungle wood and build some platforms. 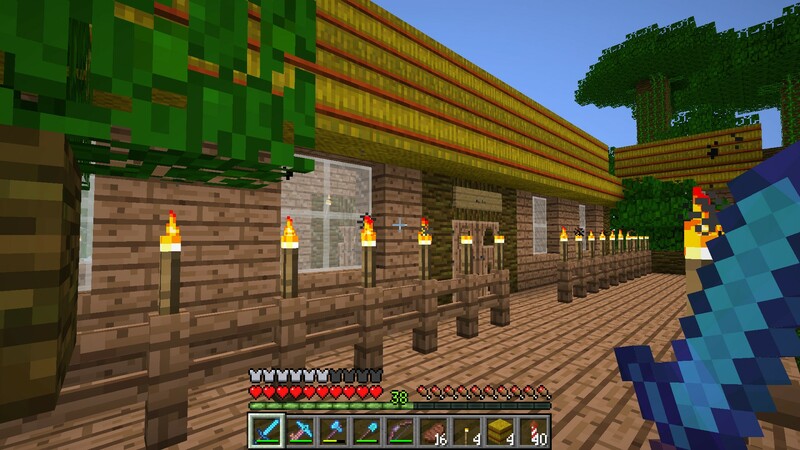 It's utterly impractical to make it so that one square on the Spectrum screen translates to one block in Minecraft, so I've had to make sure the huts will all fit into the space available. They'll be, as far as I can manage, in much the same layout as on the map above, but I'll use a bit of artistic licence for the cage traps and the walkway structure. Maybe it's now visible, after I've built all the platforms, how they all fit together. One of the huts is directly underneath another, but there's enough of a gap to just fit it in with the platform right on top of the roof. 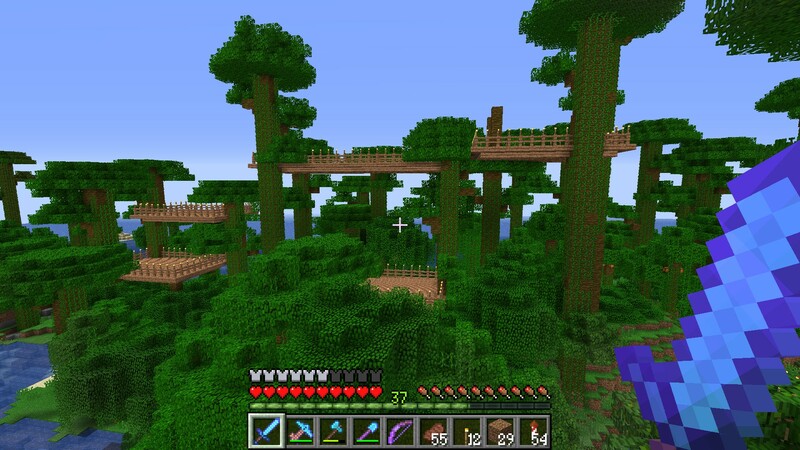 All the platforms have been wedged between 2×2 trees, some of which needed a bit of encouragement to grow to the required height (such as, clearing out some area on the ground and in the canopy above, then putting it all back again). Owing to how the structure of the walkways is built, none of them are likely to be one on top of the other, so I can't suspend a cage trap from a walkway above, so I've gone with having it already fallen onto something. In this case it is, as Paul Soares Jr. would say, a spy chicken. I had trouble with those in the original build. 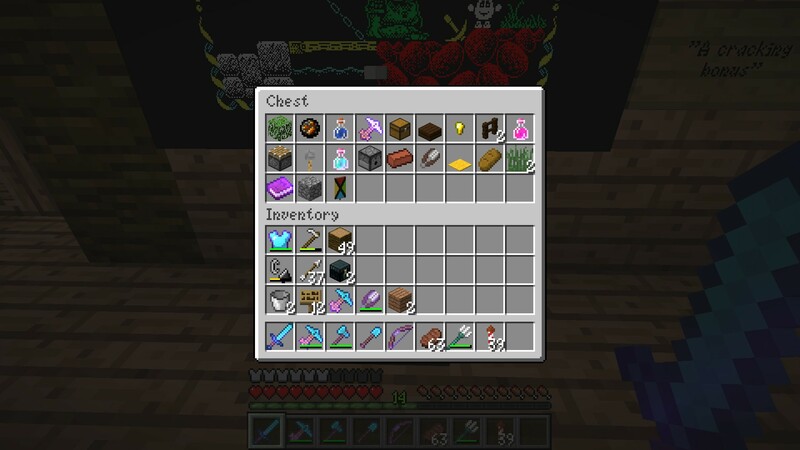 Now, no doubt some will be saying I could have some kind of springable trap, with pressure plates now being available in all wood types so I could have one made of jungle wood that springs an arrow trap, or a falling anvil... but I'd never be able to hide the redstone, and besides, I know where it is and would always be able to avoid it. Here's the second hut, a slightly improved exterior design on the original, which I'll be cleaning up so that it matches all the new ones. This one branches off slightly from the main path, though not by too much - it's to keep it as linear as possible and avoid chopping down too many trees that would be in the way. The long hut at the top of the treehouse was probably once where the Snoggles' elder lived, or at least someone important to the villagers. Here, it'll house twice the content of the others. Back on our vantage point on the top of a tall tree where I can see everything, the huts are all finished. 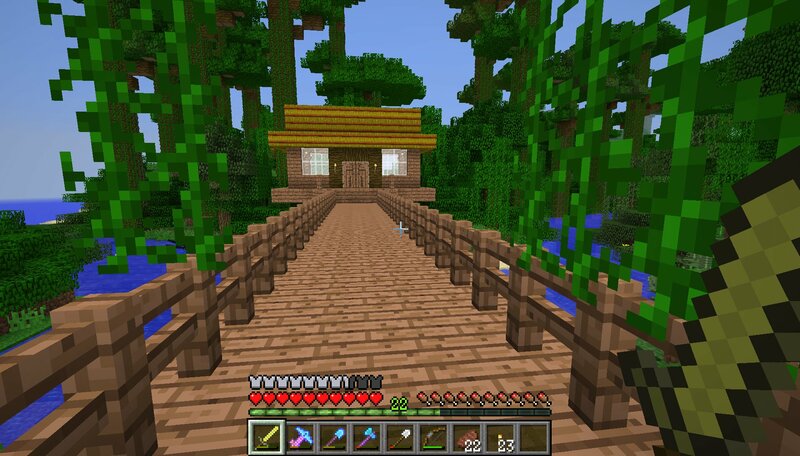 There's another walkway behind the long hut and the one on the far top right, where there's an excellent sea view (to where I can see kelp in the ocean - some new territory has generated at the further render distance I can use these days) and the third cage trap. 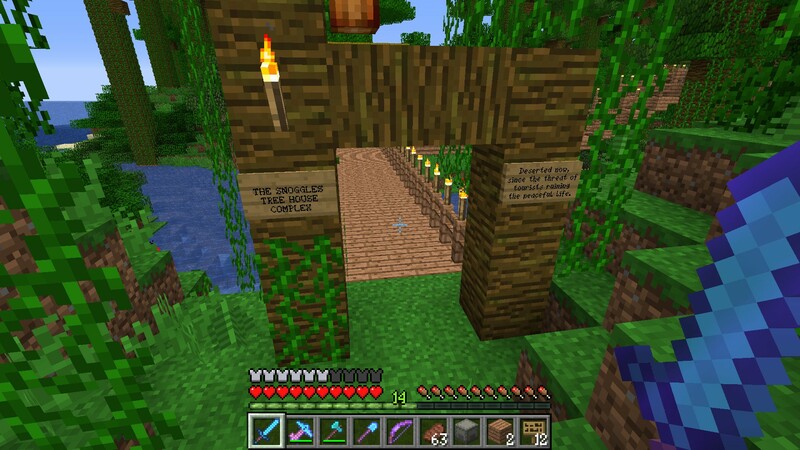 The Snoggles' Treehouse Complex is complete, and everything is where it should be now. Should we take a tour and see what's in all the huts, rather than its intended former residents? 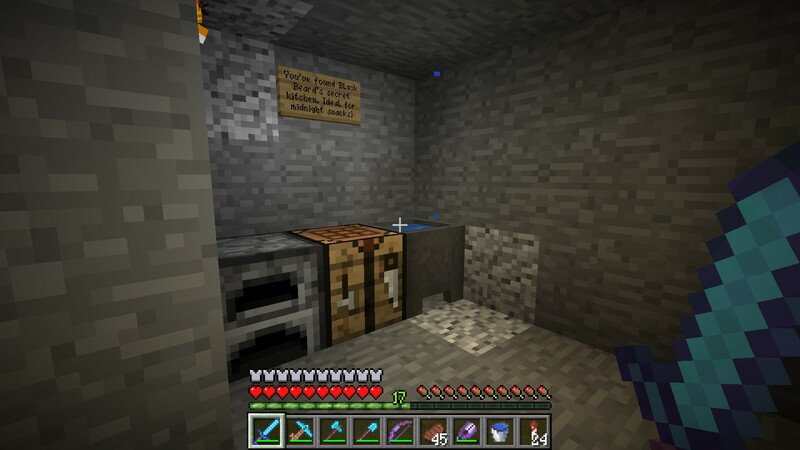 I've previously shown this screenshot in Project 15, but thought it was worth repeating, as I've repeated the text from the scroll verbatim (as was always the intention). 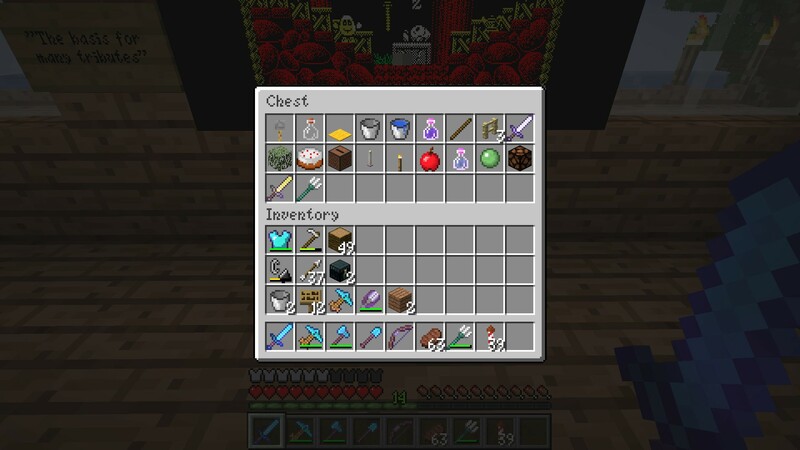 I'll link the playthrough of Treasure Island Dizzy in the treehouse tour, rather than here. Here's the first hut again, given its final makeover, with its new inside decoration visible through the holes in the jungle doors. 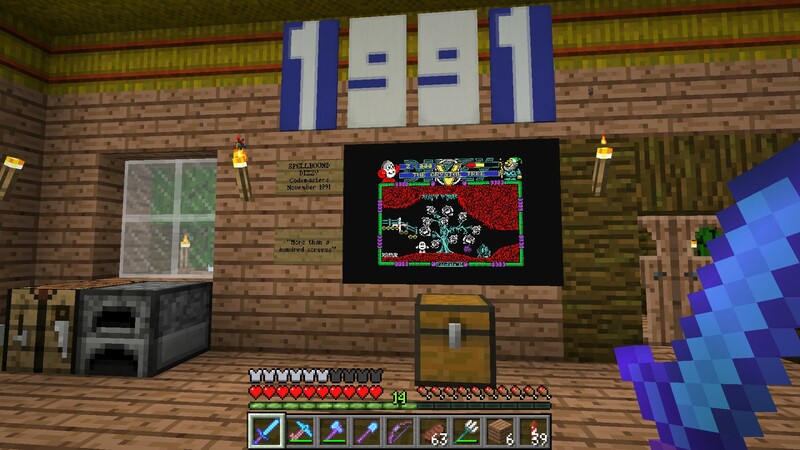 Inside the first hut, the one that survived from the original build, is where I've housed the treasures - and a wall-mounted screenshot - from the original Dizzy game, the one where it all began (as I've said on the wall). As ever, I've made the screenshot the right size (384×256) using GIMP and then translated it into 6 maps via the online tool at mc-map.djfun.de. Watch this game being completed by Jamie Angus via the RZX Archive. Dizzy was just supposed to be a face with hands and feet who rolled when he jumped (and thus made the game harder because it was easy to roll off a ledge and into danger) but the programmers were told he looked like an egg... and it stuck, and became canon. So began the first adventure of our ovular hero who became another unofficial mascot for the Spectrum in its later days, in much the same way as Horace was in 1982. 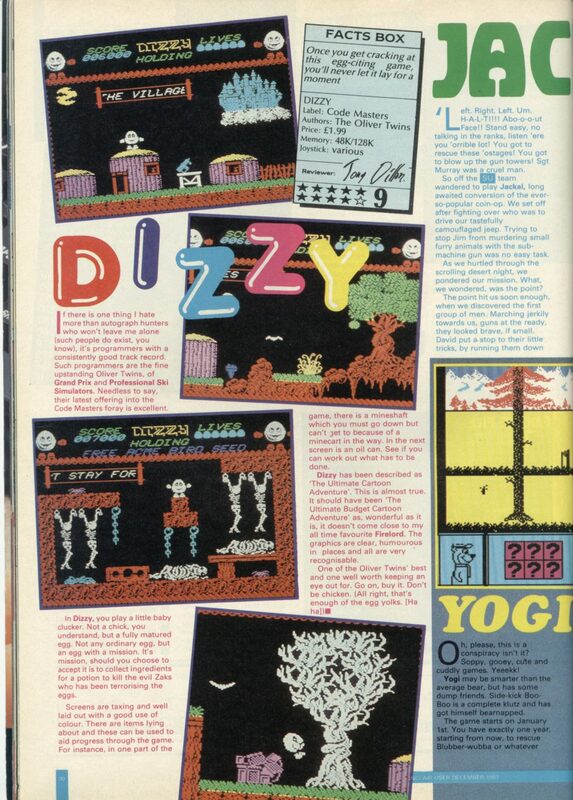 The first three Dizzy games were, effectively, refining the concept of what would otherwise be a straightforward "find the items, find what they're used for, solve the puzzles" type of platform game. Games of this type are inevitably suited to a linear playing area with plenty of left-right but not so much up-down, so the chief problem with this first game was Dizzy only being able to hold one item at a time. 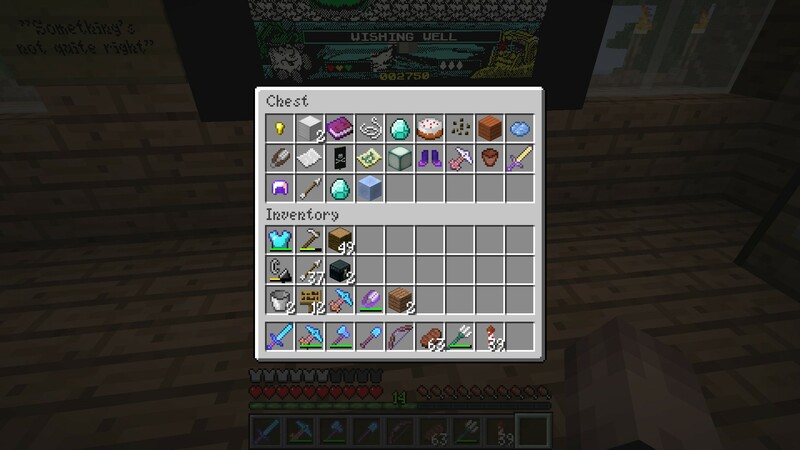 Some of them were the official quest items, some were needed to access new areas, some were to permanently remove the various hazards - animal life, falling objects, impassable rivers and so on. 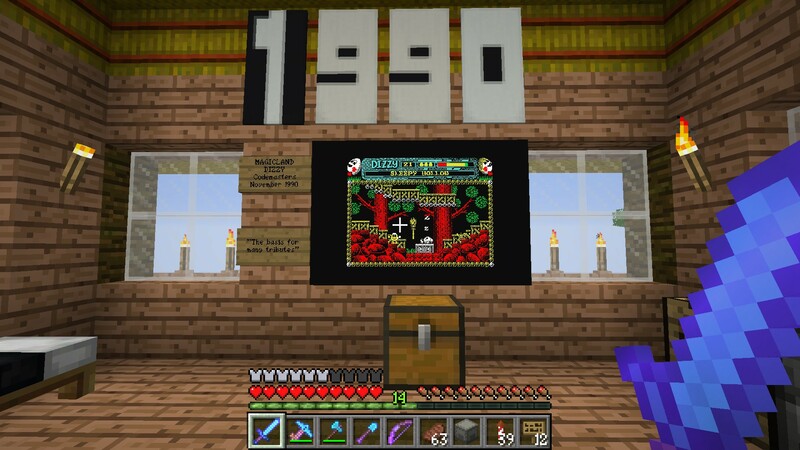 Inevitably, this meant some very lengthy fetch quests, some of them along the majority of the map - which could take a long time as the objects all cycled through the available colours and more than two on screen at a time would cause the game to slow down to a snail's pace. Still, it was a fine start, and there would be a lot more to come. 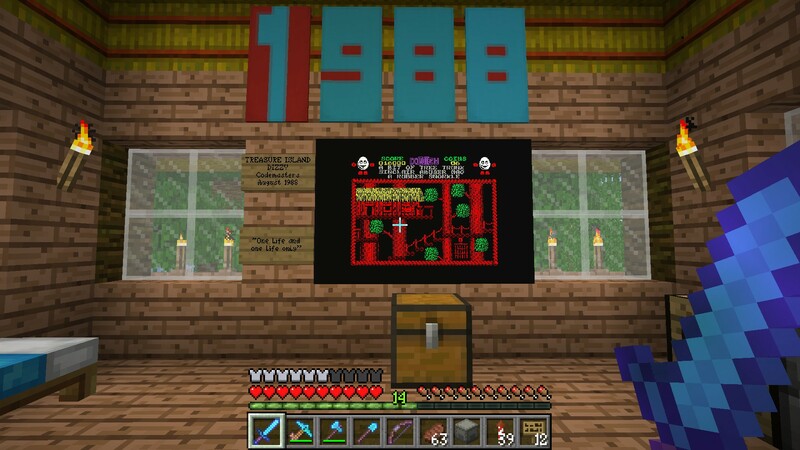 Hut number two, as seen earlier (without its door number that's vaguely visible on the long hut) is, as should be implied, where I'm storing everything from "one life and one life only" Treasure Island Dizzy, which this entire build has been themed around. The background of the year banners should correspond to the Spectrum's colour codes - 1987 was white, colour number 7 - but as there were no colours 8 and 9, I've improvised again with 8 represented by the red and cyan stripes of the loading pilot tone. I've linked the playthrough of Treasure Island Dizzy in project 15, and I'll have said plenty about it there already. 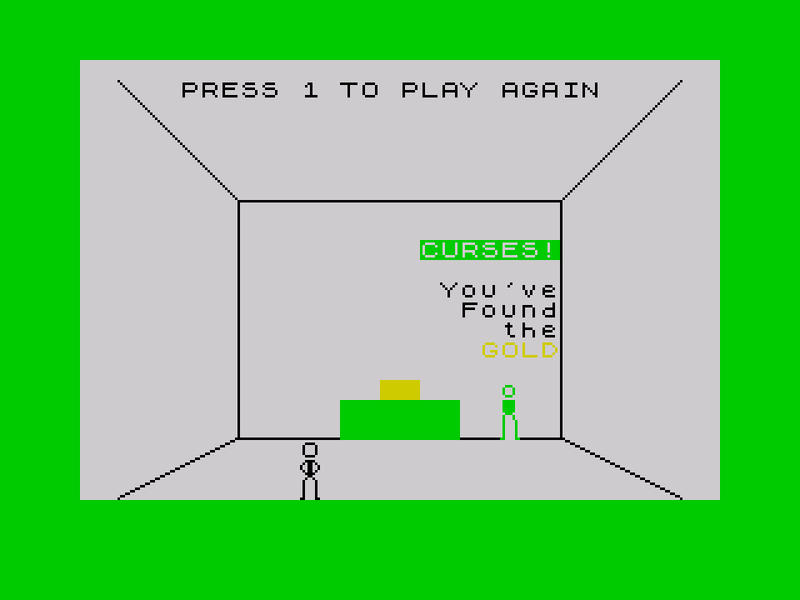 This second game in the series added the ubiquitous font, a 128K soundtrack that was missing from the original game, the side quest of collecting 30 coins, and fixed the problem of only being able to carry one object at a time, but used a scrolling first-in-first-out system. The penalty for this was that Dizzy was reduced to a single life - hit any moving creature, get trapped in a cage, drown in water without a snorkel, get fried by fire, and it's back to the start in an instant. With Dizzy positioned on the island shore at the start of the game, this has the strange side effect of being one of the fastest potential Game Over situations in the whole of gaming history, as Stuart Ashen set out to show us. He timed it at 1.72 seconds. The programmers had to do this because, drop the snorkel in water and you die, but you can never again recover it so it'd be a Game Over anyway, hence they figured the best thing to do, rather than rewrite the first-in-first-out system, was to reduce Dizzy to one life. This does also mean that the spiders, birds, bats and falling objects that Dizzy faced in the first game were removed, at least until the time came to dive into the ocean and find the second island, so it was slightly less brutal than it first seems. And strangely, this is the least colourful game of the seven; for something set on a paradise island, just about everything is red, yellow and green. That kind of colour palette would be more at home on an Amstrad CPC! And before anyone asks - yes, I have written something in all the written books that will be part of this sequence of treasure chests. 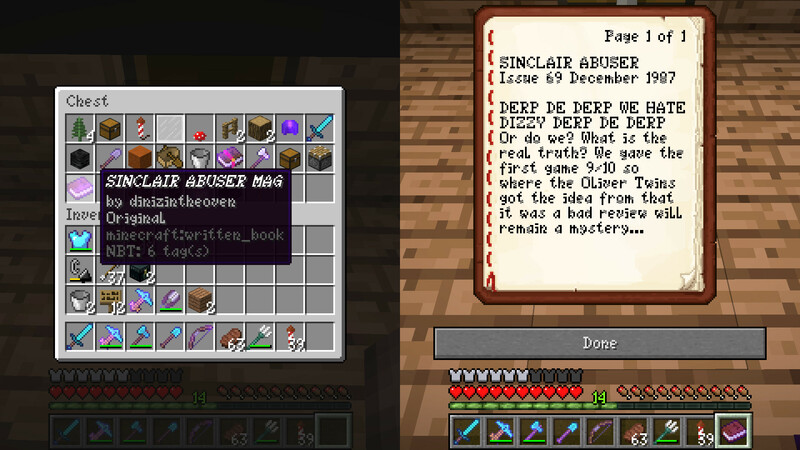 The SINCLAIR ABUSER MAG is a strange one, though. The item isn't actually needed for the quest, but can be dropped in the water (not dropping the snorkel as well, obviously) for an extra 100 points, which the score will actually scroll through rather than just adding the points directly, and this is the only time the last two digits of the score will move. Legend has it that this prank was the Oliver Twins' revenge for Sinclair User giving the first game a bad review. Error 404: bad review not found. They gave the game 9/10 and the reviewer said nice things - only concluding that Firelord was his choice for "the Ultimate Cartoon Adventure" - Codemasters were given to hyperbole about their own games even in the early days. Maybe Sinclair User were particularly harsh on other Codemasters games in comparison to Crash and Your Sinclair? Hut number three is where Dizzy went adventuring in Fantasy World. As the year ends in a 9, I've again had to improvise on the colour of the year banners, this time opting for the blue and yellow of the data actually being loaded into the Spectrum. 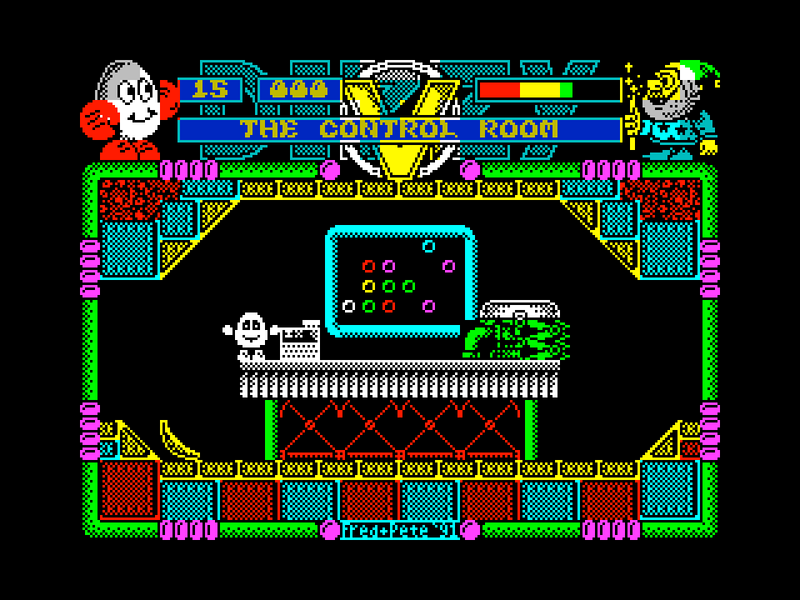 "The Yolkfolk have arrived" says the descriptive board, as Dizzy was joined by five more eggs in the form of Daisy, Denzil, Dozy, Dylan and Grand Dizzy. They'd been mentioned in the inlay card of the previous game, now here they were in front of us. 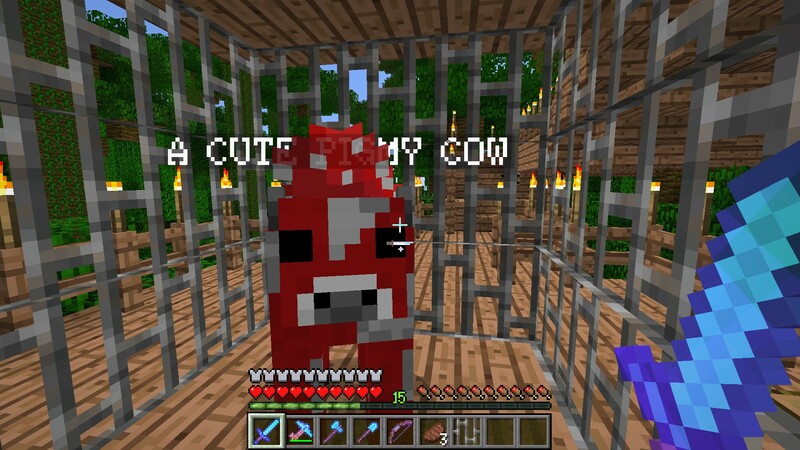 There are only 24 objects in this game, so I couldn't fill the chest anyway; one is A CUTE PIGMY COW (sic) which you've seen parked outside, another is A LARGE ROUND HOLE which causes you to drop everything you're holding, and there's a bag which is never seen in the inventory but expands its capacity from two objects to four. Here are 20 of the remaining 21. And I'm cycling through the various wood types for each game's equivalent of A PIECE OF RAILING, as you'll see. In the fourth hut, I think it's safe to say that this is where the programmers finally cracked it (if you'll excuse the pun). 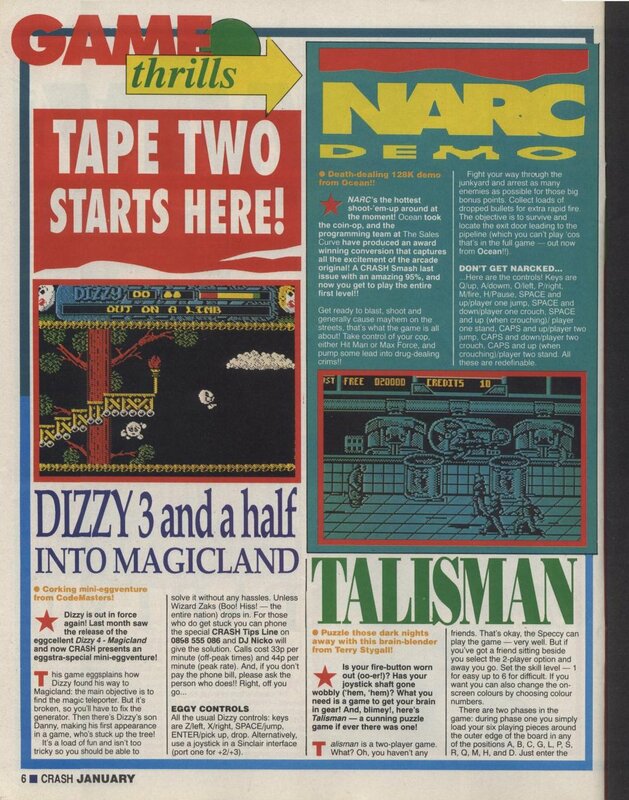 It was the first game contracted out to Big Red Software, who also handled the next two games in the series (though not the last, as we'll see), and they stamped out the last of Dizzy's shell-shattering troubles. Now, there weren't just multiple lives, there was an energy bar - contact with baddies would run it down a bit, or a lot, depending on whether they were supposed to be minor hazards or the equivalent of an insta-kill. The coins that Dizzy had to collect were replaced with diamonds, and picking one up restored some energy. Dora joined the Yolkfolk, and made her name very quickly. 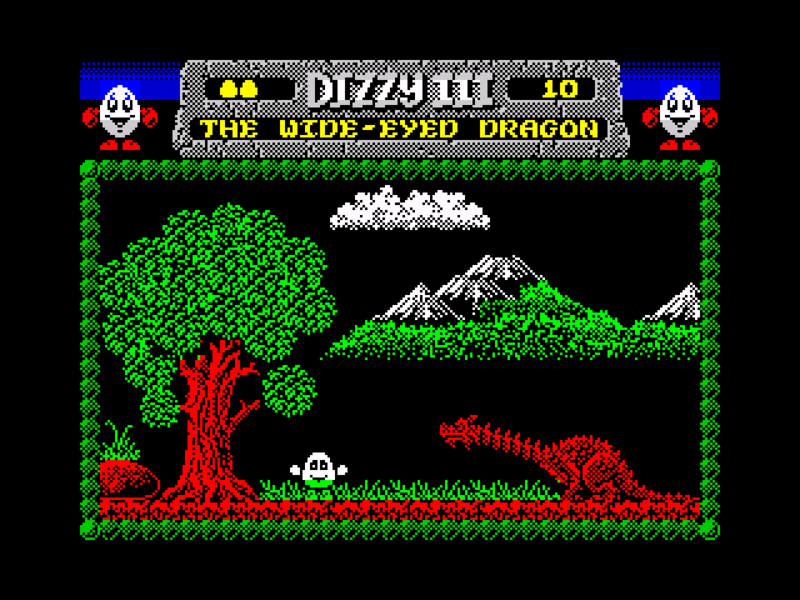 Dizzy jumped silently, and there were a few background sounds that were retained in the 48K version; in 128K, meanwhile, the game was given one of the best, if not the best soundtrack of all the Dizzy games, both adventure and arcade. So it comes as no surprise that Big Red used this game engine when developing the short prequel Dizzy 3½: Into Magicland for the covertape of Crash issue 84, and Dizzy: Prince Of The Yolkfolk, which we'll see later. 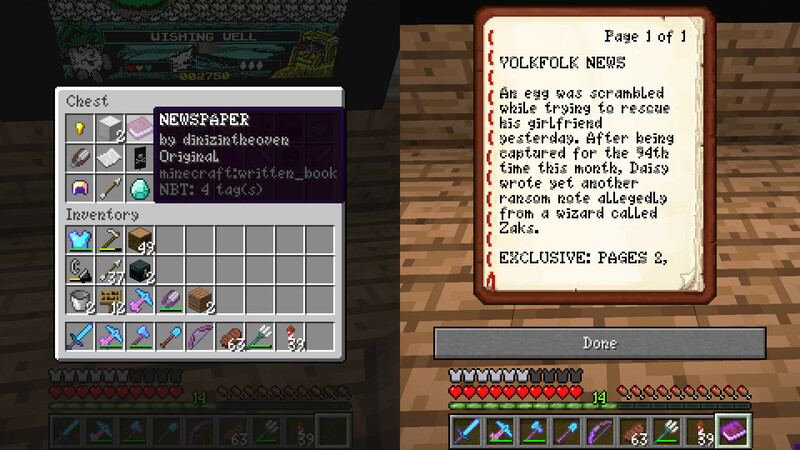 Last time, the Yolkfolk were just hanging around Fantasy World, giving out bits of advice to help Dizzy on his quest. Come Magicland, it's time to pay back the favours because Zaks has been up to his old tricks again, throwing horrible curses at the Yolkfolk that match their personalities. Dylan's, like, well into nature, man, and he's been turned into a bush. Denzil's so cool he's been frozen in a block of ice. Grand Dizzy's a bit senile and has been trapped in a backwards world. Daisy's always trying to watch her weight and has been blown up to an enormous size. Dora, the new addition to the gang, has been turned into a frog and will need the help of a prince. And then... there's Dozy, who's in such a deep sleep that it'll take something like ONE POINT TWENTY-ONE JIGAWATTS! to make him snap out of it. Oh, and, at the end, you'll be making a deal with Satan, who's actually less evil than Zaks. When I was... not in single figures (because I was 11 when the game was released but still not very good at precise control or meticulous problem-solving) I still managed to explore a fairly large amount of the map and - once I'd worked out that the Power Pill would destroy the ghosts in the swamp - managed to rescue Dora! 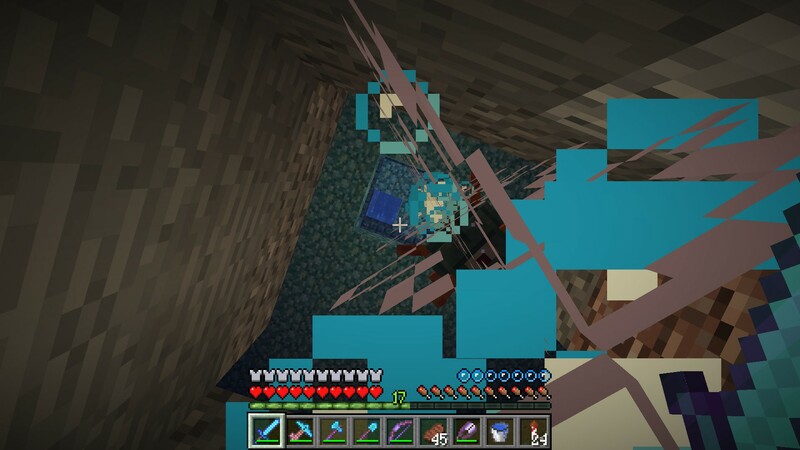 The others proved a step too far, but at least I (mostly) had an idea what I was doing and didn't spent most of the time wondering how I'd managed to die yet again. I even managed to work out how best to time jumping the shark at the front door of the castle. Was that a reference that everyone missed? Magicland Dizzy has 28 objects, and here are 20 of them. We have arrived in the long hut, which is twice the size of the others. And that's worked out just fine, because there were two Dizzy games released in 1991, that can be celebrated in the same place. 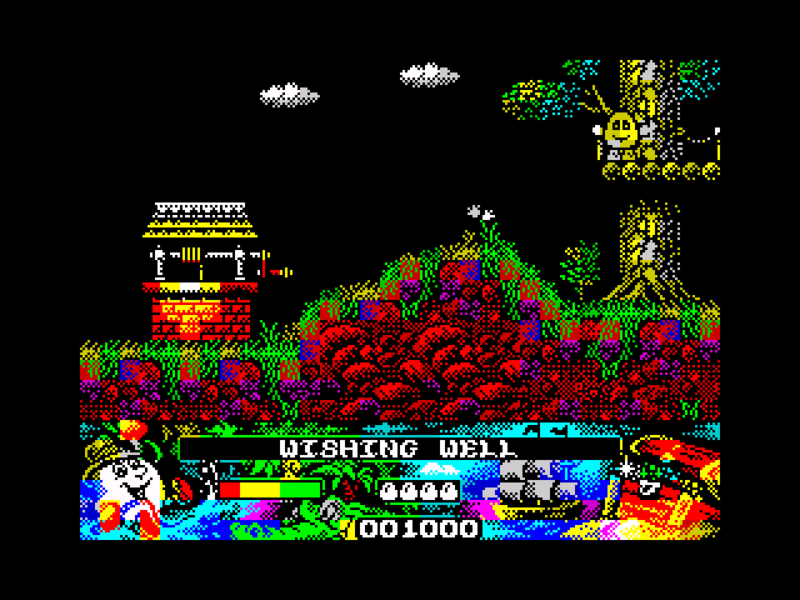 Spellbound Dizzy was the fifth in the series, with 105 rooms... 104 of which are accessible in normal play. 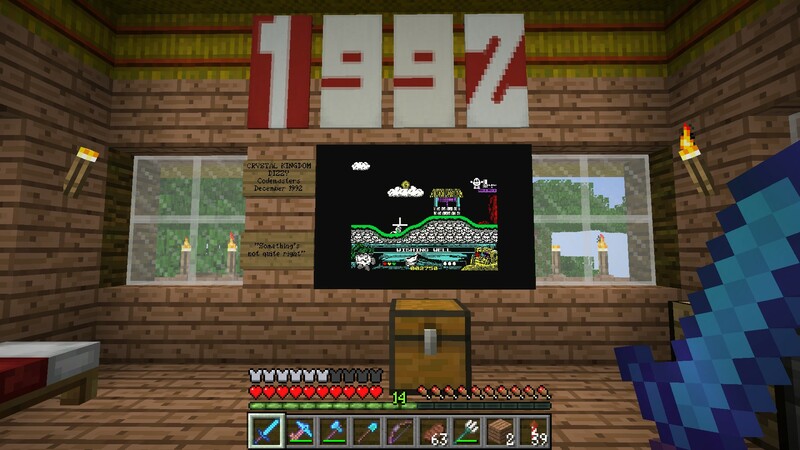 The 16-bit Atari ST and Amiga versions even told us this was more than Fantasy World and Magicland combined - which is true if we exclude any accessible blank screens marked as "Sky" (49 and 54 screens respectively make a combined total of 103; applying the same rule, the original Dizzy had 52 screens and Treasure Island had 41). Spellbound was big enough that corners has to be cut for the 48K version, such as the omission of the custom font in favour of the default character set (something of a faux-pas in 1985, let alone 1991), no soundtrack, and simplified animations. 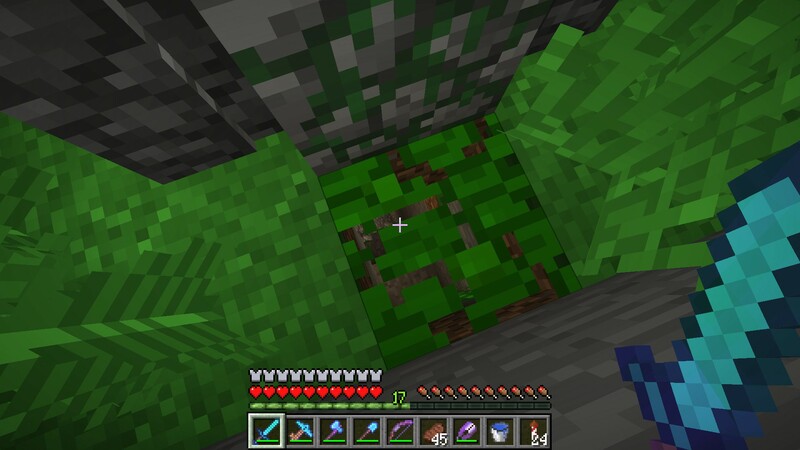 All these were mere molehills compared to the insurpassable mountain that was the inability to talk to Seamus the leprechaun in the 48K version, which kills the game stone dead at that point. Fortunately, for those who had a 128K Spectrum that was fighting fit (mine... wasn't, it turns out), the game was beatable but it didn't half take some doing, and a Multiface that allowed the use of save points was very handy! 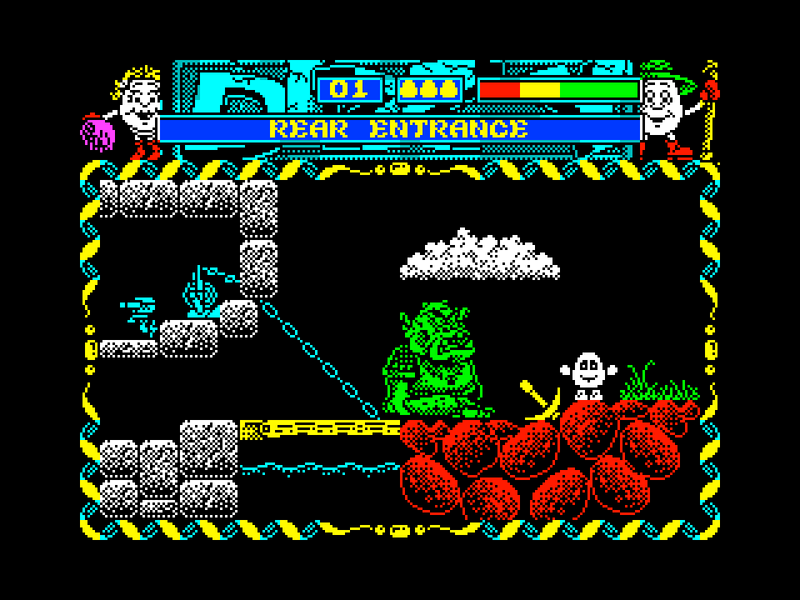 So, this is Dizzy's largest adventure (at least on the Spectrum; the 16-bits were treated to Fantastic Dizzy, a massive game combining bits and pieces of the whole Dizzy series, adventure and arcade). Dizzy's been a naughty egg, fiddling around with a spell book, and has thrust himself, all the Yolkfolk, Theo the wizard and Pogie the fluffle into a huge underground cave - and Zaks didn't even have to lift a finger. Clearly, it's Dizzy's job to get them all out again (as Theo will remind him). This involves finding each one of the Yolkfolk, who aren't in the best of moods, obtaining an item from them, and taking it to Theo along with five magic stars, this game's equivalent of the coins and diamonds. As the stars will be consumed when Theo waves his wand, there's no point in finding five and that's it - there are 40 and you'll need to find them all, and as with the three previous games, some will be hidden behind railings and stones. The puzzles can be long and convoluted; for instance, Dylan's stuck in a hole where it's damn near impossible to communicate; you'll need a megaphone to shout to him, but you'll need to get hold of Grand Dizzy's ear trumpet to hear any reply, and as both of them are somewhere down the Windy Shaft, this means bouncing on the trampette out of the deep pit, grabbing rocks, bouncing out the pit again (which always requires moving the trampette), and dropping down the shaft with just the right number of rocks as well as what you need to be carrying. It gets quite frustrating at times, all that rock ferrying. 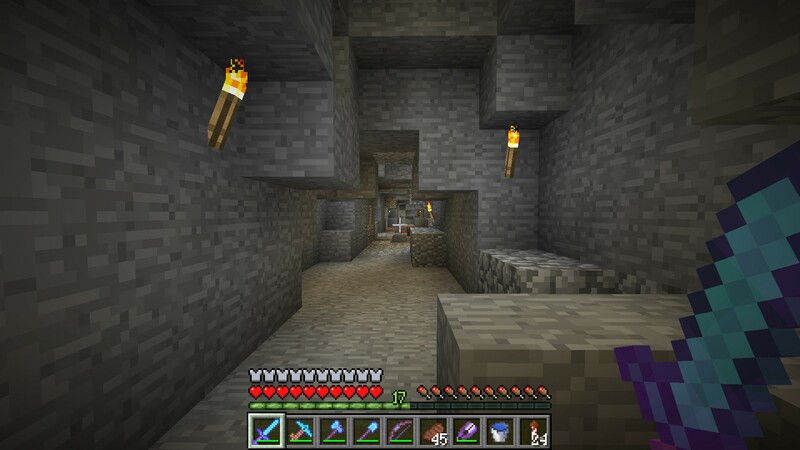 But even that is nothing compared to the pickle Dizzy will find himself in when Theo uses the last of the five stars to rescue himself; there are four more hidden rooms that contain the objects Dizzy will need to escape the cave, and none of them are obvious to first-time players. Yes, this is a long game. Maybe, some would say, too long. ...and this screenshot, originally featured in the decoration phase of the ZX80 base build, is too good not to show again. Many items in the game have two uses; for instance, you can fill a jar with honey, or with a firefly (provided you've got a lid). The item you'll need to rescue Denzil is the ZX81 he's been using as a door stop, but it also comes in useful in the pumping station. Did anyone remember that Sir Clive Sinclair once said (allegedly) it should be possible to run a nuclear power station using a ZX81? Aha! I wonder what happens if we plug Denzil's ZX81 in here and press the "NEWLINE" key... the station fires into life, and opens up another section of the game to rescue Dozy and find one of those secret items Dizzy needs to escape... although the puzzle for that one is very unwelcome for those who remembered Fantasy World! Being such a huge game, Spellbound Dizzy has 41 objects (the bag that increases Dizzy's carrying capacity doesn't count, similar to Fantasy World). 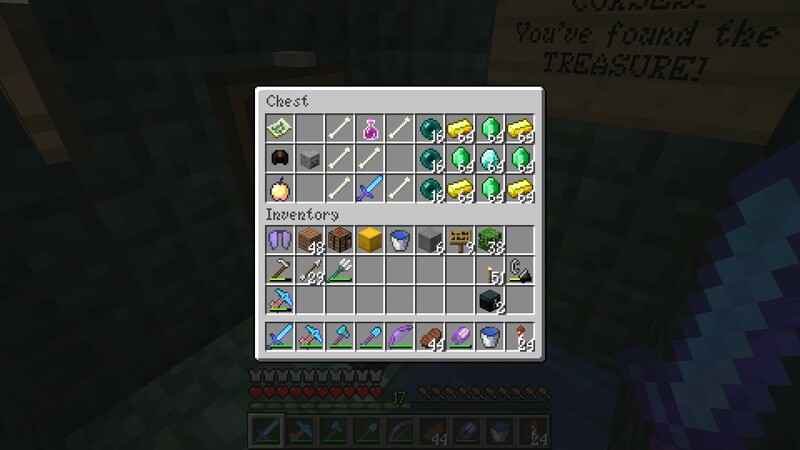 I've managed to fill the chest with 27 of them. 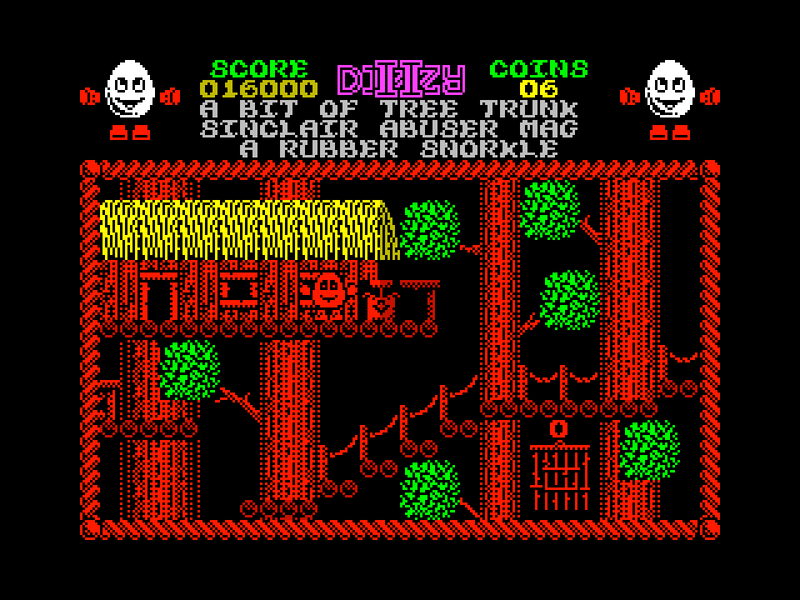 "An exclusive game for Dizzy collectors", said the title screen of Prince Of The Yolkfolk. 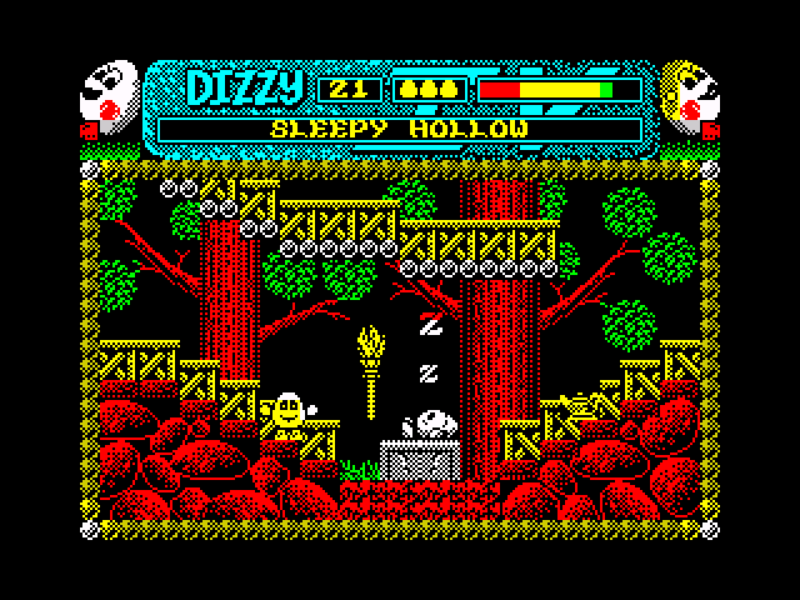 Originally, it was only launched as part of the Dizzy's Excellent Adventures package for Christmas 1991, and was seen as a bonus game, rather than the sequel to Spellbound. 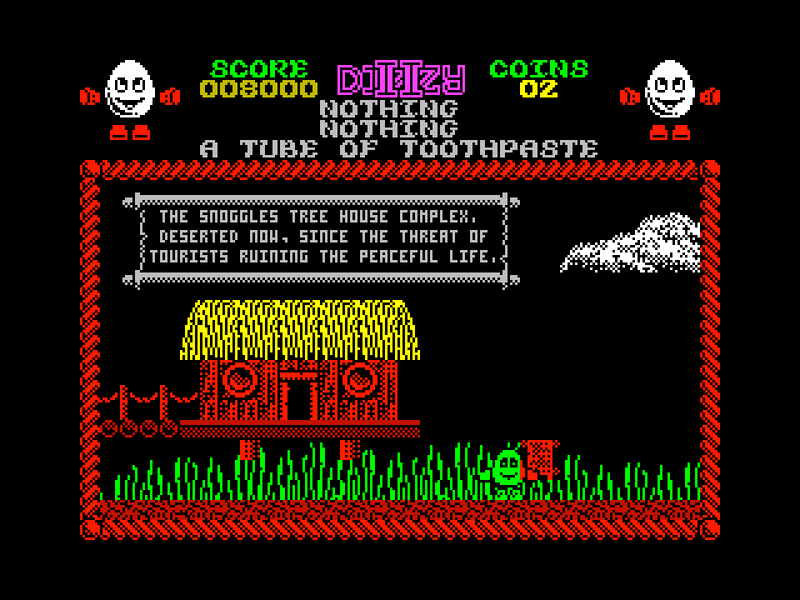 It was obviously based on the Magicland engine, it was smaller than all its predecessors (only 30 non-"Sky" screens), and the Yolkfolk weren't in it (only Daisy and Pogie are seen at any stage) but as it was eventually released as a standalone title it was accepted into the canon as the sixth instalment in the series. And it's become quite well-liked despite being, what you might call, Big Red's very own ROM hack (and the Russians, as I've pointed out above, would follow suit). I've said a lot of what needs to be said so far; Dizzy's quest in this game is to escape from his underground prison, solve a series of puzzles (if not as many in the other games), and bust Daisy out of a tower where she's sleeping to a point that makes even Dozy look relatively alert. Magic is afoot, and only a kiss from a prince will break it; can you guess who that might be? The king can appoint princes (in a ritual that's supposed to be appointing knights instead, but cut him a bit of slack here...) only he's nowhere to be seen. And if you can hack your way through the puzzles and get Daisy to snap out of her trance, she will reward you by ordering you back round the game to find 20 cherries to make a pie for Grand Dizzy. That's right, only 20 - it was 30 side quest objects as far back as Treasure Island! Despite Prince Of The Yolkfolk's smaller size, there are still 28 unique objects, of which I've collected 21. 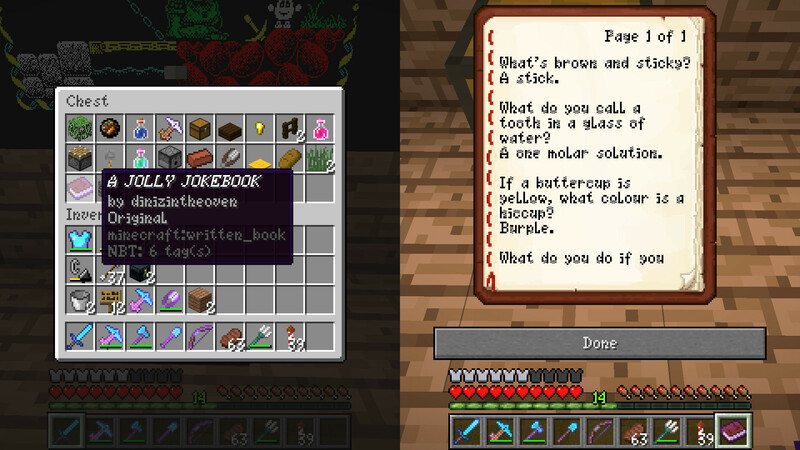 And yes, I made sure the Jolly Jokebook had some actual jokes in it. All safe for princesses and eggs alike. 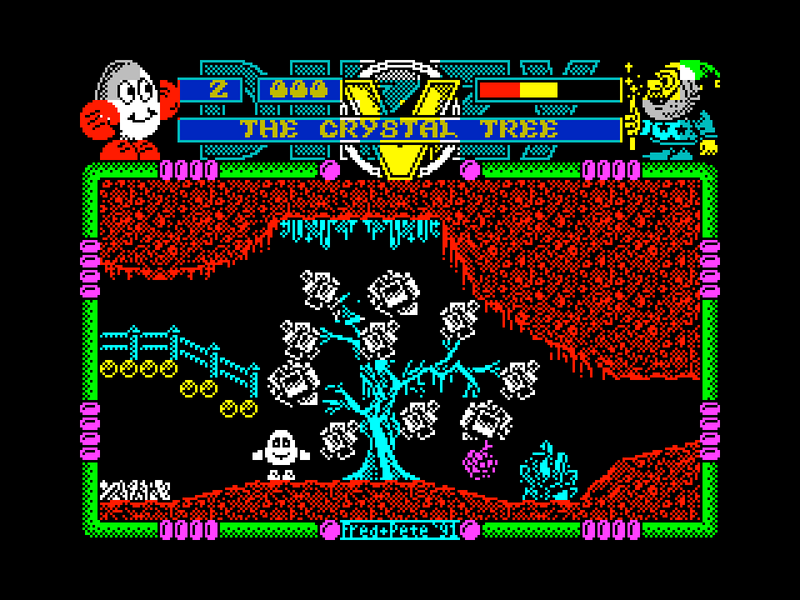 The final hut is where we find Crystal Kingdom Dizzy, the seventh and last game in the series. 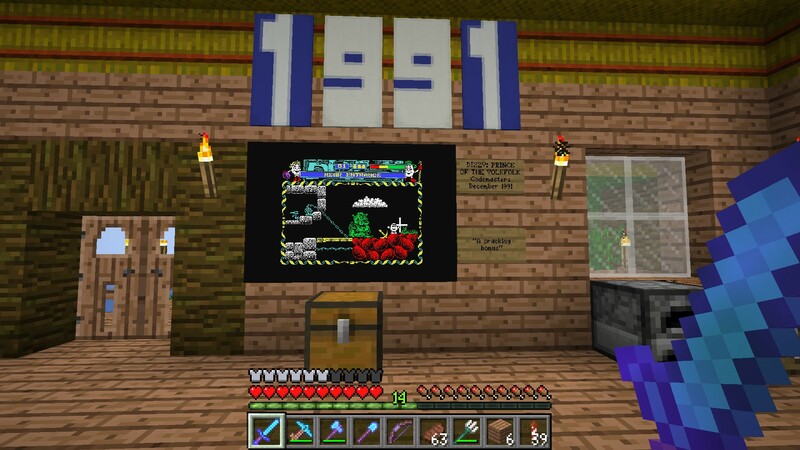 "Something's not quite right", I've said on the sign, and if you've been paying attention to the other screenshots you'll see something different straight away. All the other six games have a border around the playing area, and all of them have a changed font; Crystal Kingdom has only a bold version of the default character set. But by far the worst part was the way the game played. Through the previous six iterations and five game engines, one thing had remained constant - Dizzy's movement. He'll roll during a jump, doing two complete revolutions before landing - and might continue to roll afterwards. In this game, Dizzy rotates three times then his motion stops dead and can be controlled on the descent, Super Mario style, and will never roll at the bottom of a jump. Even more annoyingly, the front-on roll animation was removed so if Dizzy's facing forwards, he'll turn sideways to do the jump and then land facing forwards again. Big Red weren't involved in this one, and it shows; Visual Impact took it on instead, and didn't learn the lessons that Big Red had when they took over the series from the Oliver Twins. They're only listed as the developers for three games on World of Spectrum, all released in 1992, so it's entirely possible they weren't taking it as seriously as they should have done with the Spectrum in the last dying throes of its commercial era. They got the soundtrack right, though. Now, let's not get bogged down too much with its problems relative to its predecessors; Crystal Kingdom Dizzy wasn't a bad game. The amount of sheer unfathomable dreck that comes with the territory when solo programmers with big ideas but little programming skill are unleashed is entirely believable, and Crystal Kingdom will knock them all into next week. It's just that in comparison to what came before, it doesn't measure up. It was even released as a full price game, a tenner as opposed to the three quid that Codemasters asked for the first four games. Spellbound would actually have been worth it; this isn't. The puzzles in it are quite straightforward, especially in the first of the four parts, which is just Dizzy pootling round the Yolkfolk village to get a newspaper for Grand Dizzy to move onto the next stage. There's nothing in it that would have you thinking "now, what do I do with this Sharp Glass Sword?" as there was in Treasure Island, where nobody in their right mind would have thought to use it to open a grave on the second island! The conversations Dizzy has with the Yolkfolk and all the other characters are... basic, as if they'd been written by someone whose first language wasn't English, or... could barely be bothered to think of anything for them to say. I never had this game when I was younger, but I think if I did I could have beaten it at the time, not something that could be said for the other Dizzy games. That says it all. Except... the Crystal Maze sequence in the fourth part, that was a stroke of genius. Credit where credit's due, Visual Impact, that was a gem (a crystal, even?) in the sea of mediocrity. 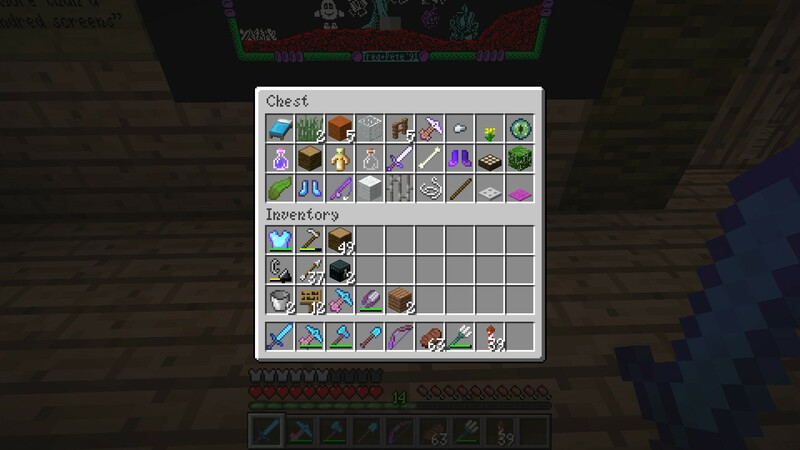 The game is split into four parts, and between them, there is a total of 38 unique objects, some of which are carried between parts. 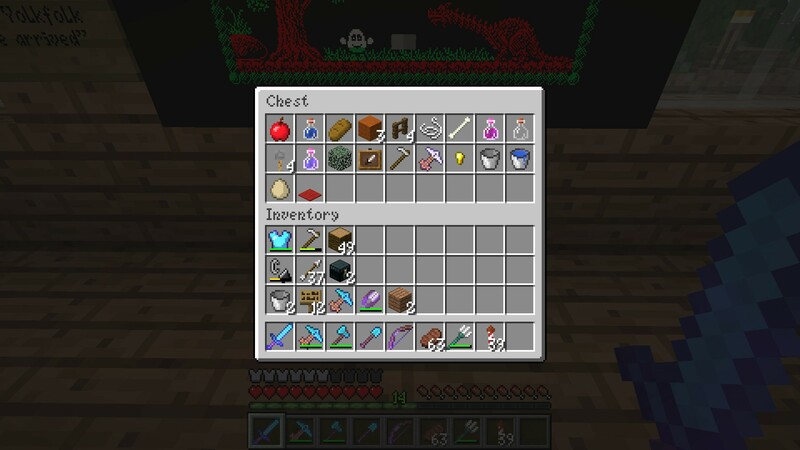 I've archived 22 of them in the chest. In the first part, Grand Dizzy wants to read the newspaper. Not only will Dizzy have to find it for him, the old giffer needs his glasses as well, they're in Denzil's workshop, and he's lost his tools. 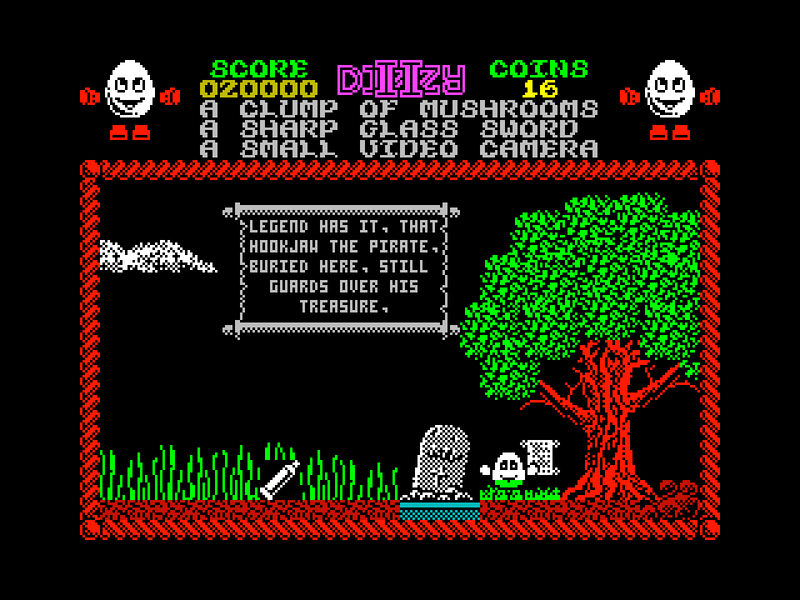 Once all these objects have been found, Grand Dizzy will take a look at the front page tell his grandson of some impending disaster that he'd have been only too happy to take on himself (if the version of him in Fantasy World is to be believed), only he's too old and his shell is creaking and Dizzy had better go instead. I thought I'd write the kind of headline that might have made the news in other games in the series. I mean, what if Daisy faked all those times she just kept on getting captured? Surely nobody could ever be that careless. After all, she isn't as pure as the driven snow. There's an implication in Spellbound that she's been cheating on Dizzy, and she is downright snappy to him in the first part of this game... given what's lurking in her bedroom that she doesn't want Dizzy to know about. Watch this game being completed by Pavel Plíva via the RZX Archive. 25 years after the original release of Crystal Kingdom Dizzy, something truly magical happened. Enter the international team of Evgeniy Barskiy, Oleg Origin and Sergey Kosov from Russia, Dmitri Ponomarjov from Estonia, and Marco Antonio del Campo from Spain. Between them, they made Crystal Kingdom Dizzy the game it was always supposed to have been. It's based on the upgraded Amiga version, uses all the 128K Spectrum's available memory, and had this been released in 1992 it would have justified its full price. Joy of all joys, Dizzy's movement has been returned to how it was in the first six games in the series, with all the animation present and correct, and the graphics have been given a very colourful and thoughtful rehash, as if they'd been moved onwards a step from Spellbound. If I had even the slightest gripe, it'd be with the new drawings of the Yolkfolk, and with some of the text obviously being written by non-native English speakers - but this is more than compensated for in the fourth part when the man who commands us to fetch the crystal from the Aztec Zone looks even more like the real Richard O'Brien than the orange-faced Amiga character does - and all this from people who'd never have seen The Crystal Maze when it was first aired! And while I said the soundtrack was the one thing Visual Impact got right, the same tune is used for all four parts, whereas this remake has a different tune for each part. If there's anything that shows what the Spectrum community can do when it's at its very best, this is one of those games that does it. "Legend has it that Hookjaw the pirate, buried here, still guards over his treasure." 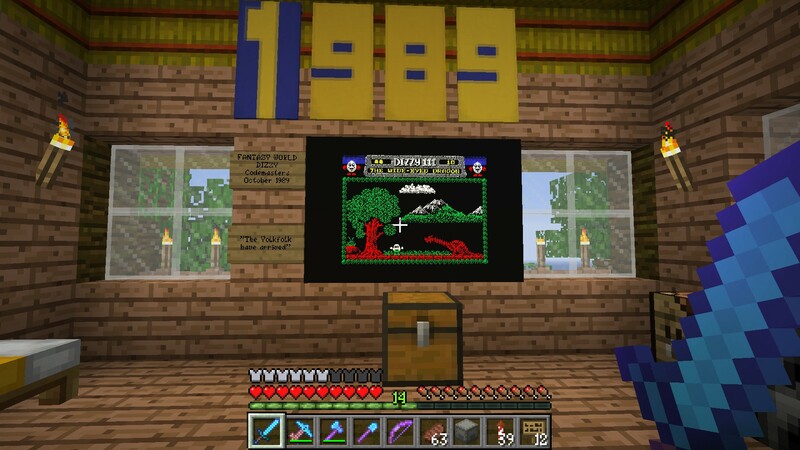 It's worth showing this screenshot again, first featured in Project 17: Cap'n Hookjaw's Fishin' Hut, for reasons which should be clear and blatant and obvious. Hookjaw's treasure is one of the four items Dizzy will need to raid from Treasure island to buy his freedom, and it is very well guarded. 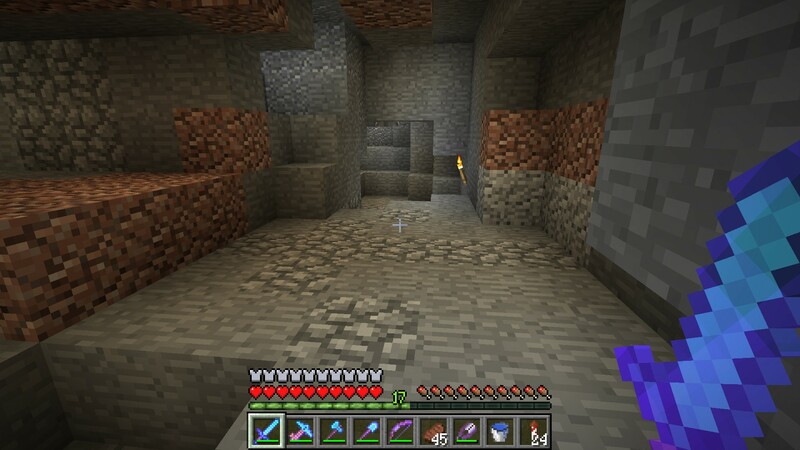 Anyone who finds the entrance to the grave will know to take a snorkel as the caves are flooded, but there's something else that'll be an absolute necessity - walk over the grave with treasure in hand without the Old Holy Bible and ONE POINT TWENTY-ONE JIGAWATTS! will shatter Dizzy's shell into a million pieces (unlike in Magicland, where it's a good thing to happen to Dozy). 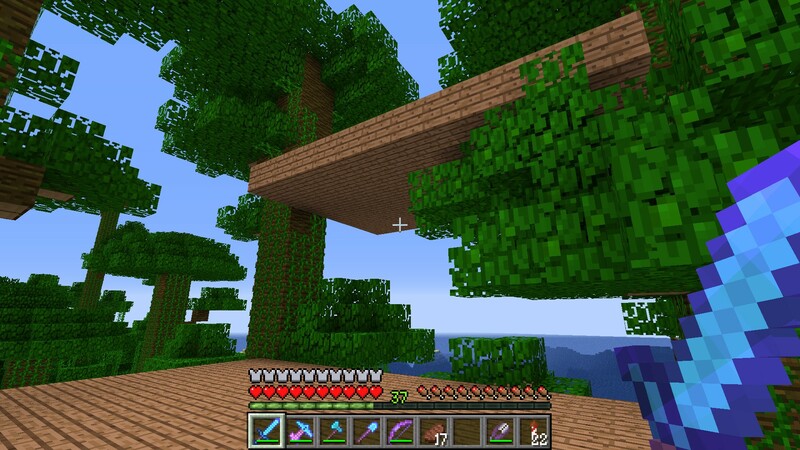 What's that I see in the increased render distance from the top level of the treehouse? I do believe it's an ocean monument. There's usually treasure hidden in those, at a cost of having to battle some very tough one-eyed fish that shoot laser beams. 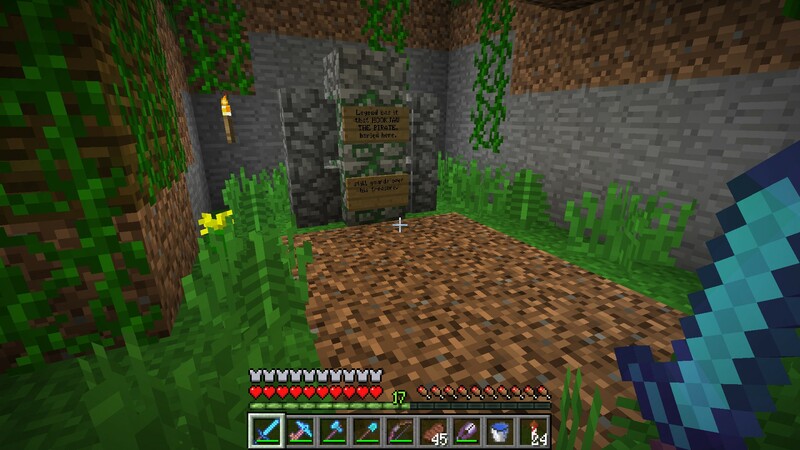 And what's this behind the grave? It looks like some leaves covering the entrance into a cave. Looks even more worth investigating! There were some vines to climb down, which lead into a long passage carved through the rock. I say "carved", it looks more like someone's used some badly-spelled STICKS OF DINAMITE to blast the passage under the sea. Hang on, what's this? A subtly-shaded arrow in the rock, giving us a clue that there's something there, as if we're in a top-down RPG? This must be worth a look. Black Beard must have been a bit mad to build a kitchen under the sea, in a long passage where another pirate's remains are buried. Still, at least he thought to catch the drips percolating through the ceiling, because it's not as if running water is going to be common in these parts. "WARNING! MAGIC WALL OF WATER!" was a notice that crudely hand-waved the fact that the sea that guarded the STICKS OF DINAMITE suddenly... stopped. 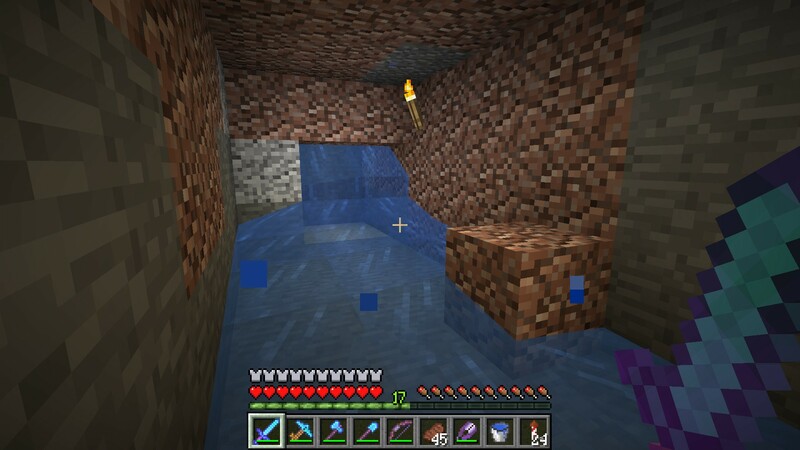 In Minecraft, there is no need for such hand-waving as the water that's gushing in from the ocean doesn't flood the caves up to sea level, it's quite happy to just... stop. Still, we can't stop, there's bound to be something up there, something valuable. 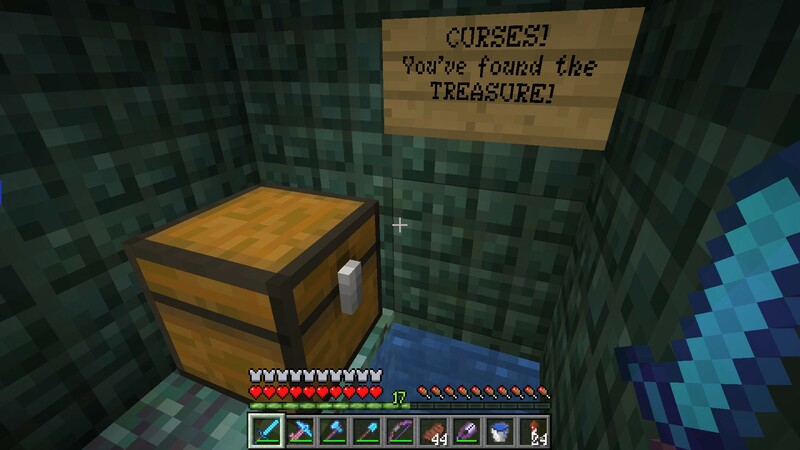 Yes, Hookjaw, you may shout curses all you like from beyond the brave, but I've found your treasure, and I'll bet it was worth it! No video available at the RZX Archive... or anywhere else! And there's a reason this game isn't available at the RZX Archive, nor is it ever likely to be - it's not a commercially released game, it was a type-in listing from the June 1983 issue of ZX Computing. This was one of the magazines I had a copy of as a nipper, but I never dared take on such a dauntingly long type-in at the time, as I always made mistakes that I couldn't see. However, it's long since been done by someone who has the right level of attention to detail, and everyone can "enjoy" this effort from Clyde W. Bish that was absolutely fine for publication as a type-in but would never have been given a second look by any commercial seller. I remember the screenshots on the page of ZX Computing revealed the "ending" of the game, in that there was an ending (before starting all over again) with the leprechaun being quite, quite mad that you'd found his gold. And this is the first thing I thought of when writing the sign with Hookjaw's final message!